By the beginning of 1996, the crowds had finally had enough of Hulk Hogan. The company had resorted to piping in cheers in case of booing or putting him with popular sports stars (Kevin Greene) to get the fans cheering. Hulk was being booed by fans everywhere, no longer the south. Hogan hit the point of oversaturation, a point that he was hitting in 1991 when the crowd was 50/50 for him against Undertaker at Survivor Series. That’s why Vince wanted to make him the Babe Ruth of wrestling as he coined, trot Hogan out for the special appearance every now and then, keep him fresh. It wasn’t like the rest of the Amazing Friends were being booed by the fans, Sting was still massively over and Savage despite being a WWE guy endeared himself to the fans by working hard and having a great feud with Flair. The Hogan and Giant feud was continuing and hatred for Hulkamania, and his ridiculousness of his creative control was reaching its zenith at Superbrawl. First, Hogan and Giant were the main event, not the continuing grudge feud between Flair and Savage for the WCW World Heavyweight Championship. It should also be noted that the most deadly weapon in the company at the time was a high heeled shoe as it both did significant damage to Hulk and Savage. Hulk and the Giant went through another bad match as the crowd showed no mercy on Hogan. Hulk was booed throughout the entire match and you have to remember this wasn’t the south. This was the Cow Palace in California; Hulk should have been a hero in this territory. Instead, you’d think that Hogan came out in a Cowboys jersey or something. Hulk won and then The Dungeon came out to try and attack Hogan. I do mean they try as the entire Dungeon of Doom gets a beating from Hogan as he delivers pitiful chair shots to seven men. They introduced Hulk’s new big enemy, Loch Ness Monster who really wanted to fight Hogan. For those of you that don’t know, The Loch Ness Monster was British wrestler and occasional Stampede regular, Giant Haystacks. By the time he was lined up to be Hogan’s new enemy he had been wrestling for 29 years and was 50 years old. Yep, they were trotting out a fifty year old man to face Hogan, who was turning 43 that year. Sadly, Haystacks was diagnosed with cancer after joining WCW and presumably a big money run never happened. Sorry to be a downer on that last part. You’d think that after the less than stellar reaction that Hogan received in California that the company would rethink their plans for Hogan. Hulk was already scheduled to take off after Uncensored, make it a gift to give him an extra month off. Instead, the company would unleash its newest concept: The Doomsday Cage match. What was the Doomsday Cage match you may ask? Well, it was a takeoff the old Tower of Doom match that happened at the 1988 Great American Bash. It was a precursor to the Triple Decker cage that WCW would trot out in 2000, the company was hoping that the Tower of Doom would be the next big gimmick match after WarGames. It wasn’t. The match was tough for the fans to see, the cage was clunky and difficult to operate and I’m honestly surprised that it didn’t fall apart with ten two hundred pound plus men fighting throughout it. The match also sucked. The storyline going into the match was that The Four Horsemen and The Dungeon of Doom formed an alliance….The Alliance to End Hulkamania. Sullivan issued the challenge for Hogan to face the entire group in The Doomsday Cage match. At some point, I presume that the idea of Hogan going over the entire group on the table and I also presume that Flair was going to do the job. I’m just guessing that Hogan and Bischoff had a running tally on how many times they could make Flair cry in a year. The winner would get Turner’s credit card for two nights of debauchery. You’d think that cooler heads would prevail and they would add Savage, Sting, Road Warriors and I can’t believe I’m saying this but the Booty Man to the match. Instead, they went with Hogan and Savage. Interestingly enough, Brian Pillman was a part of the group and it was rumored that Hogan campaigned heavily to do something with Pillman during the match, so that he could squash him and kill off The Loose Cannon character. Pillman smartened up and requested his release before such a thing could happen. To counter this, the company dragged Zeus out of obscurity (Now Z-Gangsta) and Robert “Bane from that Batman move you wish you could forget” Swanson and added them to the match. Yes, they brought Zeus back to revive a feud that died almost a decade ago. Swanson hadn’t been on the national wrestling stage in almost a decade and was named The Final Solution. Are we sure that Mel Gibson wasn’t secretly booking WCW at the time? That was cheap, but worth it. You remember about what I said about the original Tower of Doom match and how it was tough for the fans to see and it was a mostly poor effort since you’re putting cage-on-cage without any solid footing for the wrestlers. It was also tough for the fans to see since the actual match took place in a set-up near the entrance. I’m just going to presume that fans didn’t see it on the jumbotron at the arena, so there be a lot of gawking of the necks to see it. If somebody offers you a chance to watch it, don’t since it is a beyond awful match. It managed to have a negative three star rating and snagged the worst match of the year award from the Observer. Observe that, Hogan. Oh yeah, Flair jobs in the end. 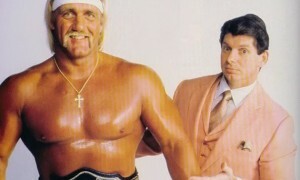 Hogan would take his hiatus, not before defeated Sullivan and Anderson (Whom defeated Hogan twice on television) in a handicap match in around four minutes.